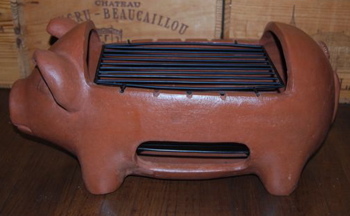 A terracotta pig grill, like this one, is a type of outdoor grill that you don't see as often in the United States. However, these grills and other types of terra cotta grill can have some advantages and many can be found on the market. One form of ceramic grill are the newer models such as the great Big Green Egg grill seen to the right. The ceramic construction is outstanding for temperature control and for retaining moisture for juicy, succulent grilled foods. However, more commonly seen on the market, and considerably less expensive are terracotta pig grill options which have some advantages as well as disadvantages. Inexpensive: Most simple terracotta ceramic grills are relative inexpensive. Small models often cost no more than 20 to 40 dollars. Just fill with charcoal and start cookin'! Portable: Most terra cotta pig grills are small and lightweight and therefore a good options for portable grills you can take with you to the campsite, the park, the beach or anywhere else you want to cook up some simple grilled foods. Weather-Proof: Terra cotta is water-proof and therefore does not need any special care if kept outside. While it is somewhat fragile, water and other weather will not damage it much. However, the grill grate itself is metal and may rust if left outside for long periods of time. Easy to Clean: Because they are small and portable for the most part, clean up is easy. Simply wait until the grill is cool and dump out the ashes. You are ready to grill again! Good for Basic Direct Heat Cooking: While they are not suited for longer indirect heat grilling, these give off good, intense direct heat to perfectly grill up burgers, hot dogs, sausages and other simple barbecue fare. General Small Size: Most terra cotta grills are small. Examples such as the terra cotta pig grill pictured on this page are only big enough to grill a single steak or a couple burgers at a time. If you are just grilling for yourself or a couple people, this may be adequate but otherwise you may want a bigger grill. No Lid: Most ceramic grills do not have a lid. Therefore they are not suitable for slow roasting or indirect heat cooking. Stick to foods that just need to be seared or quickly cooked such as hot dogs, sausages, burgers, steaks or other small cuts of meat. Breakable: Terra cotta is relatively fragile compared to a metal grill. Therefore care should be taken to prevent the grill from cracking from a fall or grill tools banging into it. Of note, the terracotta pig grill pictured here is not for sale. I got this terracotta pig grill several years back from Cost Plus World Market. However, last I looked they do not carry it anymore. I have received literally dozens of emails asking about this cute thing. I apologize but I don't know where you can find this specific grill currently. Done learning about the TerraCotta Pig Grill? Return to the Outdoor Grill page. page.